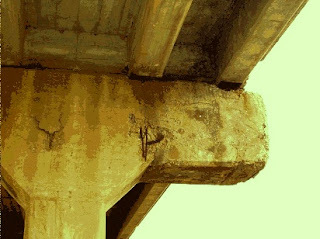 It is considered that corrosion of reinforcement induced by chlorides is the biggest problem for the durability of reinforced concrete structures, it is a mechanism related to physicochemical conditions of the structure and the external environment (HELENE, 1993). 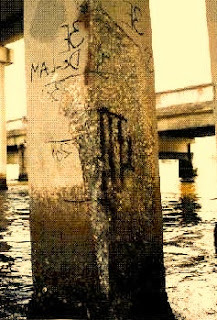 It is often observed, especially in structures exposed to marine environment. The localized corrosion or pitting usually occurs by the formation of micro, being observed in the corrosion of reinforcement induced by chlorides. Chlorides penetrate the concrete by the concentration gradient, whose attack is very much more intense than with the carbonation, resulting in rapid formation of pits (Brown, 2002; CASCUDO, 1997; ELSENER, 2002). In many cases the corrosion in the form of pits opened in points near the armor with the highest concentration of cloretos16 and / or the inclusions surface or the passive layer of steel. (CASCUDO, 1997, Brown, 2002). Above a certain concentration of chloride, the passivation first start the dissolution of portlandite layer around the armature due to increased migration of ions follows the destabilization with little or no chemical dissolution of passive layer (LEEK, POOLE, 1990 apud SAKR, 2004). The proximity of chlorides increases the migration of ferrous ions in the passive layer so that the passive barrier is less effective in keeping the last link in the metal. Finally, at some point, the layer ceases to exist and is replaced by an anodic region (TRAUENBERG; FOLEY, 1971 apud GAID 2004). Despite this explanation, the mechanism by which chlorides accelerate the corrosion of the reinforcing is complex and not completely understood (CASCUDO, 1997; GAID 2004). It is that in the presence of chlorides, the protective layer can be destroyed even the values considerably above pH 11.5, if the armor around a concentration of chlorides enough (JUNG, YOON, SOHN, 2003). 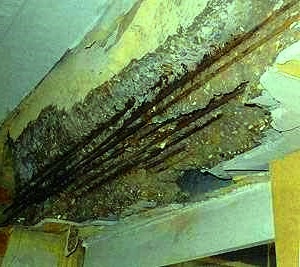 Corrosion Induced Damage In High Stress Cantilever Design. The presence of chlorides in concrete, in a concentration above a certain threshold, produces two simultaneous effects: an increase in conductivity of the electrolyte layer and disruption of oxide protective armor. The breaking of the oxide layer is due to the formation of a soluble complex of iron chloride and chlorides, which makes it permeable and unstable, making it easier dissolution of metal ions (Brown, 2002; HELENE, 1993; SAKR, 2004; YALQYN; ERGUN, 1996). After starting the engine, the pits begin to function as cathodes (SAKR, 2004). Electrons released in the anodic areas are attracted to the area forming a cathodic current electric Icorr (SAKR, 2004). The potential difference existing in different locations in concrete, which may be a result of their own concentration gradient of chloride, is the force electromotive initiating reactions between anode and cathode (THANGAVEL; Rengaswamy, 1998). Cracked And Spalled Marine Bridge Piling. Because of that, once started, even a small amount of chloride can support the mechanism of corrosion, and its influence (Brown, 2002; HELENE, 1993; THANGAVEL; Rengaswamy, 1998). Indeed, not only the concentration of chloride that governs the loss of passivity under all conditions of exposure, but also the relationship chloride-hydroxyl (Cl-/OH-) because the hydroxyl ions act as inhibitors. Experiments show that with increasing pH, the limit of chlorides for the loss of passivation reinforcement also increases. Other parameters such as diffusion of oxygen to the cathodic areas, they also influence significant (HUSK, 1997; HELENE, 1993; JUNG, YOON, SOHN, 2003). The balanced to the increased alkalinity of the aqueous phase of concrete, from the alkaline compounds Na +, K +, Ca + + and OH-, can be changed when the relationship Cl-/OH- reaches values greater than 0.61 (HAUSINAN, 1967 apud HELENE, 1993). When his equilibrium ceases to exist, starts the passivation of the reinforcing (CASCUDO, 1997; HELENE, 1993 Monteiro, NEPOMUCENO, 1996). However, this relationship is controversial, and other authors discuss other relations Cl-/OH- limits, depending on variables such as the water / cementitious material, the composition of cement (alkali content), the alkalinity of the concrete-steel interface and content of items (BAUER, 1995; COSTA; GASTALDINI; ISAIA, 2002; Erdo?du; KONDRATOVA; BREMNER, 2004; LAMBERT; SOYLEV, Francois, 2003). 1986 cited in Brown, 2002). If chlorides diffuse connected as NaCl, may occur exchange reactions of Cl-for OH-, which does raise the pH by the formation of NaOH (Birnin - Yauri, GLASSER, 1998). On the other hand, if the hydroxyl are leached, even driven by displacements, chlorides are broadcast into the concrete, causing a reduction located in the pH of the water pore (BYFORS, 1986 cited in Brown, 2002). At the anode, hydrogen free, formed according to equation, can lower the pH between 7 and 4.6. Thus, the pits may have pH lower than 7 (BAUER, 1995; GLASS; Büenfeld, 2000; HELENE, 1993), while the cathode can increase the pH (BAUER, 1995). The mechanism of transport of chloride by the concrete can occur by total absorption in simple contact, followed by diffusion or by capillary action and then later broadcast. When capillary pores are relatively dry or partially saturated, chlorides can penetrate absorption and capillarity, or may remain dissolved in fog droplets saline on the surface, but the absorption tends to dominate (Bashir; KROPP, CLELAND, 2001; Conciatori, 2002; HONG; HOOTON, 1999). And when they are relatively saturated, the diffusion becomes the transport mechanism dominant, driven by chemical potential difference, especially to larger thicknesses. Even in periods of drying, the diffusion of chlorides into the concrete continues to occur, because the pores remain saturated for some time (ANDRADE, 1993; BASHER et al., 2002; Bashir; KROPP, CLELAND, 2001; BAUER, 1995; CASCUDO, 1997; Conciatori, 2002; HELENE, 1993; HONG; HOOTON, 1999). These mechanisms may act simultaneously or in sequence can prevail over successive periods. Similarly, the type of transport mechanism may vary different locations within the concrete (Bashir; KROPP, CLELAND, 2001). Chlorides may also enter by direct access through the cracks in concrete or migration (BASH et al., 2002; CASCUDO, 1997; HELENE, 1993). However, the time needed for chlorides to diffuse the thickness of cover thickness to the armor in enough to break the passive layer depends mainly on the absorption capillary (NEPOMUCENO, 2005). The intensity of the diffusion of cloretos17 is related to the proportioning of concrete, the pore structure, the cracks on the surface of the concrete, the thickness and cover thickness the ability of setting the stage aluminum chloride-ferritic (Erdo?du; KONDRATOVA; BREMNER, 2004; HELENE, 1993). The water / cement ratio controls the penetration of chlorides due to their influence on porosity and transport properties. Surely, the concrete with the water / material cementitious as low as possible is equally or more important to giving rise concrete with low diffusion coefficients of chloride (CASCUDO, 1997; Erdo?du; KONDRATOVA; BREMNER, 2004; HELENE, 1993; JAU; TSAY, 1998; MEHTA; Monteiro, 1994; OH et al., 2002). Page, Short and El Tarras (1981 apud HELENE, 1993) found that the rate of diffusion of chloride increased from 4 to 5 times with a increasing water / cement ratio between 0.4 and 0.6. The refinement of pores promoted by slag can reduce the penetration of chlorides, test as prescribed by ASTM 1202:199718 (HOU, CHANG, Hwang, 2004; Yeau, Kim, 2005). It was found that Portland cement concrete resistant to sulphate, low - tricalcium aluminate, C3A, showed the highest coefficient of effective difusão19, ranging 60 m² / s to 115 • 10-13 m² / s for a water / cement ratio of 0.5, came just below the ordinary Portland cement and cement with additions of pozzolanic materials. Concrete with cement containing more than 65% of blast furnace showed the lowest effective diffusion coefficient, with values ranging from 0.3 meters / s 2 • 10-13 m² / s (MEHTA; SCHIESSL; RAUPACH, 1992 apud HELENE, 1993). Work Oh et al. (2002) showed that the concrete with slag from blast furnace ground in content of 25% (total mass of binder) and compressive strength at 28 days 41.8 MPa, showed penetration of chloride of about 1 / 3 of concrete reference (no slag and compressive strength at 28 days of 42.3 MPa). The reduction in the penetration of chloride observed in concrete with slag (content addition 65% of total mass of cementitious material) compared to the reference concrete, was around 86% in the work of Castro et al. (2004). Experience Sivasundar and Malhotra (1992) showed that, after 28 days, the load of passing chloride penetration of concrete with high levels of slag (50 to 75% by mass total of cementitious material) was exceptionally lower when compared to concrete control, and ranged between 174 and 383 coulomb coulomb20. (BAUER, 1995; DHIR, EL-MOHR, Dyer, 1996; GLASS; Büenfeld, 2000; ISAIA, 1995; JUCÁ, 2002). Livres21 chlorides are not fixed, most influencing reinforcement corrosion (CASCUDO, 1997; ISAIA, 1995). The sum of free and combined chlorine is called chlorides totais22 (BAUER, 1995; CASCUDO, 1997; HELENE, 1993; ISAIA, 1995; JUCÁ, 2002; ackz SWAMY, 1996). Much of the work undertaken with the slag granulated blast furnace shows that the fixing ability is improved in chlorides and specific folders that contain this material compared with others only with Portland cement, by decreasing the level of free chlorine and reduce the diffusion coefficient of chloride (Castro et al., 2004; COSTA; GASTALDINI; ISAIA, 2002; LENG; FENG, LU, 2000; XU, 1997). The setting of chlorides in these compounds reduces the concentration of free chlorine in a region in the concrete and, consequently, the trend spread to the interior can then be reduced (Bashir; KROPP, CLELAND, 2001). In advanced ages, the benefit of the refinement of pore diffusion provides even lower, and low permeability, this property is one of the most significant in cements added with slag (BAUER, 1995). Other ions dissolved in the pore solution slag concrete with blast furnace help restrict the mobility of chloride because they lower diffusion capacity (HELENE, 1993; LENG; FENG, LU, 2000). However, the salts formed in the reactions of attachment may be crystallized and cause shrinkage and resulting microcracks, which in turn can facilitate an accelerated rate of migration of aggressive fluids (KURDOWSKI, 2004). This is eminently the real structures exposed in the external environment does not cover, and especially with salt spray, which are the result of the effects of wetting and drying and cause the crystallization of salts inside (CASCUDO, 1997; HELENE, 1993; MEHTA Monteiro, 1994). The chemical reactions of chlorides with cement paste start with calcium hydroxide and calcium aluminate hydrate, depending on the cations in solution (Treadaway, 1988 apud GLASS; Büenfeld, 2000). Chlorides react with C3A and the C4AF cement Portland and produce cloroaluminatos (or Friedel's salt 3CaO • Al2O3 • CaCl2 • 10H2O) and cloroferratos (Fe2O3 • 3CaO • CaCl2 • 10H2O) (Büenfeld, 2000; DHIR, EL-MOHR, Dyer, 1996; JUCÁ, 2002; Treadaway, 1988 apud GLASS, Taylor, 1992). Studies Dhir, El-Mohr and Dyer (1996) suggested by measures of thermal analysis that great improvement in the determination of chlorides was the result of higher alumina content of slag granulated blast furnace in relation to Portland cement clinker, due to production quantities more salt Friedel. The ability to fix chlorides widened with an increase content to replace up to 66.7% slag granulated blast furnace ground (DHIR, EL - MOHR, Dyer, 1996). Bauer (1995) found that the composite cement with high slag oven (24% by mass) had a beneficial effect on the ability of attachment to a chloride water / cement ratio of 0.5. The determination of chlorides in CSH, the concrete with high levels of slag have less fixation capacity compared to concrete without slag, because the former have smaller C / S in CSH (BAUER, 1995 and Taylor, 1992). Besides the presence of aluminates and iron compounds, aluminates, other important factors influence the determination of chlorides: the proportion of replacement of cement by slag granulated blast furnace, the concentration of hydroxyl in the pore solution (or pH), the cation of chloride salt, the water / cementitious material, sulfates, alkalinity, among other (BAUER, 1995; GLASS; Büenfeld, 2000; HELENE, 1993; JAU; TSAY, 1998; LUO et al., 2003; XU, 1997). Cementitious materials, the inter-relationship Cl-/OH- is more complex because of the setting chloride and pH dependence of it (SANDBERG, LARSSON, 1993). It was found that the fixation and adsorption capacity of chloride decreased with increasing concentration hydroxyl (BAUER, 1995) in pH above 12.6, and conversely a decrease in pH resulted in the decrease of this relationship Cl-/OH- (TRITTHART, 1989 apud DHIR; EL-MOHR; DYER, 1996). 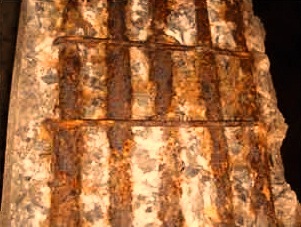 The dissociation of the fixed chloride salt form of Friedel, during the lifetime of the structure concrete, and put the armor to a higher risk of corrosion (Birnin-Espinar; GLASSER, 1998; GLASS; Büenfeld, 2000; GOÑI; GUERRERO, 2003; HELENE, 1993; Ackz SWAMY, 1996). It was found that chlorine chemically combined and hysically adsorbed were quickly released when the pH of the pore water decreased to less than 12.5. Less than 2% of acid-soluble chloride remained fixed after the pH fell to 11.5, for at least two phases, Friedel's salt and CSH, fixed chlorides (Bashir; KROPP, CLELAND, 2001; GLASS; Büenfeld, 2000; Prückner; Gjørv, 2004). Theoretically, chlorides limit may present a risk of corrosion much like chloride free. The practical implication of this is that while setting chloride slows its own penetration, while permitting the accumulation of chloride content more likely to increase the risk of corrosion in some situations (GLASS; Büenfeld, 2000; HELENE, 1993). Due to the destabilization of calcium hydroxide and calcium aluminate hydrate in chemical reactions and the fixation of chloride, depending on the solubility of chlorides, a substantial reduction of the pH of the pore water occurs and many products become hydrated unstable (KURDOWSKI, 2004). If there is also the effect of hydrolysis and leaching, it could lead to a significant increase in total porosity of cement past (Burlion; BERNARD, Chen, 2006). The blog gives the good content for the science related students..